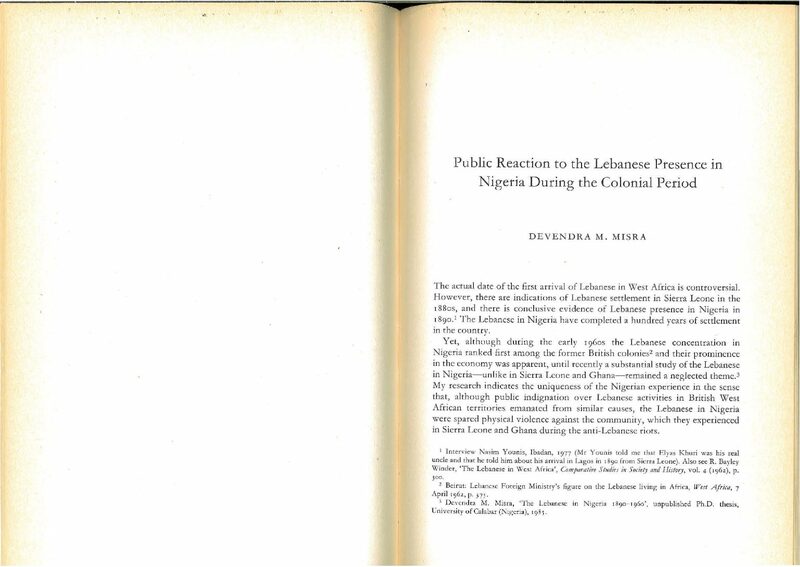 Devendra M. Misra (1994), Public Reactions to the Lebanese Presence in Nigeria During the Colonial Period, in Albert Hourani and Nadim Shehadi, eds., The Lebanese in the World: A Century of Emigration (London: Centre for Lebanese Studies, 1994). 565-578. The paper focuses on (1) the late colonial period in Nigeria, in particular the Nigerian Federation during the mid-to-late 1950s, and especially on (2) political controversy over Lebanese immigration and Lebanese-owned businesses in the debates of the House of Representatives in 1955; it looks at the debates (4) within the broader context of British West Africa, in comparison with Sierra Leone and the Gold Coast/Ghana. The Lebanese-Nigerian community appears in the debates and proposed laws (1) as business-men, (2) as aliens (or as sleek Syrians and grabbing Lebanese ) and (3) non-Nigerians not of African descent. 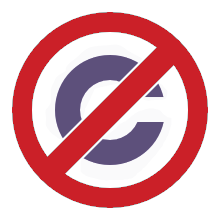 As such they face accusations similar to those directed against Lebanese migrants elsewhere in British West Africa and Francophone West Africa, here mainly on grounds of economic protectionism and claims of exploitation. On Misra’s account, they are largely defended by the British colonial administrators, and ultimately protected by the African majority in the House of Representatives against further restrictions on immigration or economic activity (on grounds of fairness and non-discrimination, or on grounds that the community is a positive factor in economic development; in the later debate it’s claimed that existing restrictions on economic migrants will serve well enough as a form of protectionism without adding additional restrictions). The minority view in the debates is elaborated at much greater length in the paper, which targets the Lebanese community as (1) business competition to Nigerian traders and as sector monopolists; (2) as a middle-man minority, taking roles as moneylenders, real estate moguls, or exploitative employers; (3) as beneficiaries of discriminatory practices by European firms and banks; (4) as allegedly engaged in devious or unscrupulous business practices, as allegedly gaining profits through tricks or through criminal activity and smuggling; and (5) in the wake of independence, as potential sources of political corruption and as cozying up to Northern Nigerian political parties. Misra briefly discusses some of the defensive social and (often sub-rosa) political activity of Lebanese-Nigerians, but mostly deals with how they engage in business and how they are portrayed by other political actors. Misra argues in particular that although public indignation over Lebanese activities in British West African territories emanated from similar causes, the Lebanese in Nigeria were spared physical violence against the community, which they experienced in Sierra Leone and Ghana during the anti-Lebanese riots [in 1954 and 1948 respectively]. Primary sources are drawn mainly from Debates in the House of Representatives , Federation of Nigeria, for 1955, documents from the colonial administrative archive, and some interviews with a handful of Nigerian and Lebanese-Nigerian authorities. The chief secondary sources are Misra’s own Ph.D. thesis ( The Lebanese in Nigeria 1890-1960 , University of Calabar, 1985), Bayley Winder’s The Lebanese in West Africa ( Comparative Studies in Society and History , 1962), and Marwan Hanna’s series on The Lebanese in West Africa ( West Africa newspaper, 1958). Bauer’s defense of Levantine economic migrants is mentioned (but only as quoted in Winder).